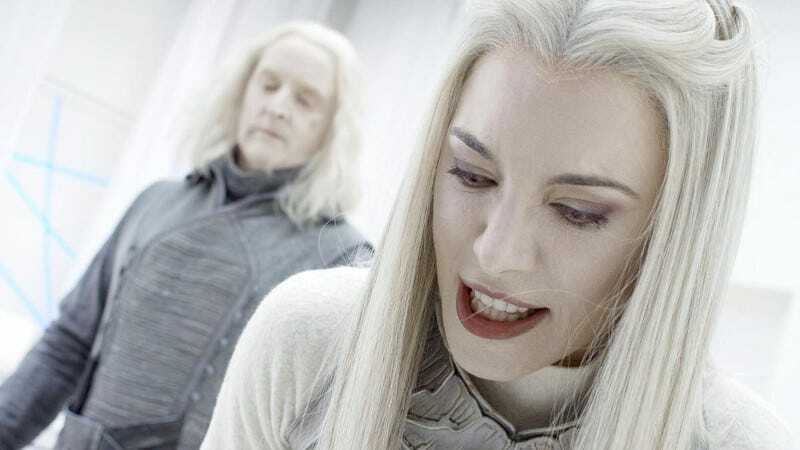 This week’s episode of Defiance features the kind of heartwarming story of family love we have come to expect of Datak, Stahma and Alak Tarr. And Amanda’s hair braid is magic. Spoilers ahead. “Where the Apples Fell” picks up right where the last episode ended with an angry Alak holding a knife to his mother’s throat. Datak confronts Alak while a terrified servant runs for the Lawkeeper. Datak was street fighting before Alak was born so it’s no surprise that Alak gets schooled. Stahma expresses her disappointment in her son after a well-placed kick. Alak gets the last word by diming out his parents to Nolan. Datak seeks help from Yewll, who is her usual cheerful friendly self. Yewll is willing to help the Tarrs but will stay in Defiance. Amanda’s braid has won her over. Even though Berlin, Alak and Nolan clearly see Yewll helping Datak with no sign of duress it looks like she is getting a pass on aiding the spies. From a pragmatic point of view I can see cutting the only doctor in town some slack. Maybe that will be addressed in a later episode. Anyway, Datak is captured and interrogated by Nolan. After last week’s episode I figured Nolan really was willing to shoot Alak but it was a bluff. It seems like Alak may finally become his own man after his staged scene with Nolan. Datak has many flaws but he does give respect to the two who played him so well. Meanwhile Stahma surprises Amanda in her office. She has a pistol she acquired after killing a deputy (another crime to add to the charges against Stahma). Amanda is in no mood to be a hostage so they end up fighting. Amanda gets knocked out but Stahma caught a shard of glass in the gut. Amanda’s braid works its magic again when Stahma lets Amanda live for the second time (she could have blown the Arch while the mayor was up there speaking on the radio). The wounded Stahma ends up on T’Evgin’s doorstep. A visitor arrives in Rahm Tak’s camp who turns out to be his Irathient wife with a message from Votanis Collective. It turns out Rahm Tak has gone rogue. The Collective sent him on a recon but Tak has escalated his mission to an invasion of Defiance. His bosses want him to stand down since his attack could spark a new war with the Earth Republic. But Tak is too caught up in his vision of Manifest Destiny. He kills her (“Consider that a divorce.”) and tells his followers that she was really an assassin working for the humans. It must be nice to have such blindly loyal followers who won’t question something that makes so little sense. Nolan and Datak have a nice quiet scene at the end where they do some lawman/criminal bonding over Rafe McCawley and Datak’s impending execution. I just don’t see Amanda having a forgiving moment when it comes to the Tarrs so I wonder how this will play out. Alak isn’t going to turn into a badass overnight but it looks like he’s learning to cope with the world. Irisa is getting attached to little Luke. That might be heading towards a few different possibilities. Of course Berlin is the ex-girlfriend of the arms dealer selling stuff to General Tak. Some of the Votan residents aren’t as worried about Tak as the humans are. Will that become a factor in the upcoming battle? The actress playing Rahm Tak’s wife also played the aristocrat who hired the Killjoy team. I am old enough and have consumed enough books and movies about the Vietnam War to feel some dissonance when the Votanis Collective is referred to as the VC. Speaking of being old, it seemed to me like every other commercial break for all three shows in Syfy’s Friday lineup had Kelly Hu pushing Viagra.